We have another beautiful 2018 Accord on display in our Showroom! 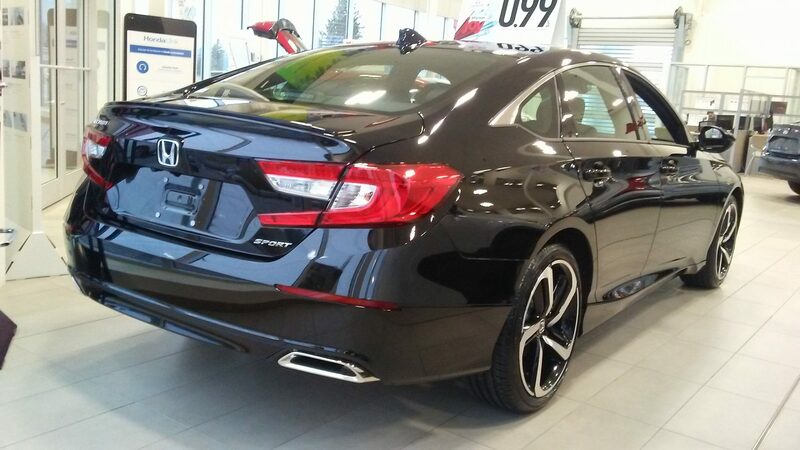 This 2018 Accord Sport is shown in the “Crystal Black Pearl” colour, and features a combination leather and fabric interior. Under the hood is a 1.5L, 16-valve, DIrect Injection, DOHC, i-VTEC, turbocharged, 4-cylinder engine with a Continuously Variable Transmission (CVT). This engine and transmission pairing creates an average fuel economy of 8.2/6.8/7.6 L/100km (city/highway/combination). The Sport trim level has some unique exterior features, like its 19 inch aluminum alloy wheels, dark chrome grille, and body-coloured side sill garnish. It also comes with a rear decklid spoiler, a dual exhaust with chrome finisher, and front splash guard. Inside the Accord, you will find a power moonroof, aluminum-trimmed sport pedals, heated front seats, and a second row of folding Magic Seats. The 2018 Accord Sport has a wide selection of fun and functional technology. 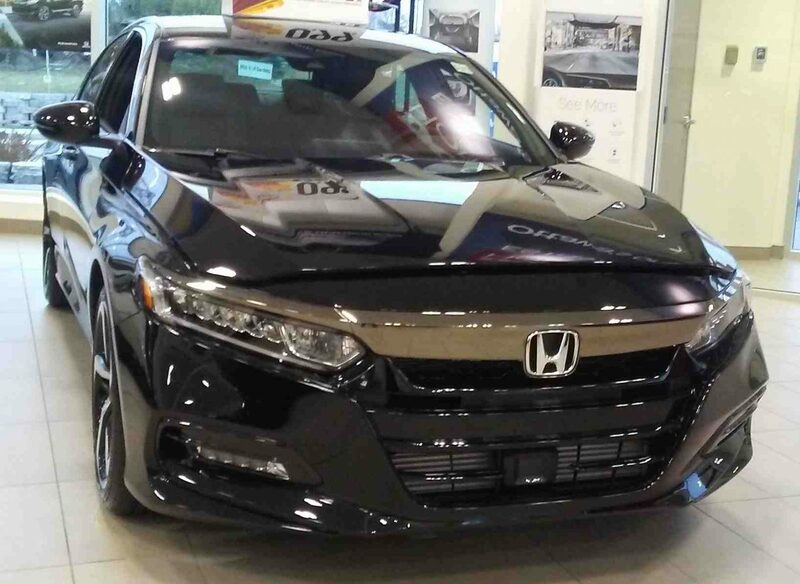 It comes with the entire Honda Sensing package of safety features, which includes the Collision Mitigation Breaking System, Forward Collision Warning, Lane Departure Warning, and more. But the safety tech doesn’t stop there! The 2018 Accord also comes with HondaLink Assist, LaneWatch blind spot display, and a multi-angle rearview camera. To make life a little easier, the Accord includes a remote engine starter, proximity key entry, and pushbutton start! If you would like to make a handsfree call, listen to music, or use apps, the Accord has you covered with its Apple CarPlay, Android Auto, and HondaLink 2.0 compatibilities! If you have any questions about the 2018 Accord, click here to contact us!